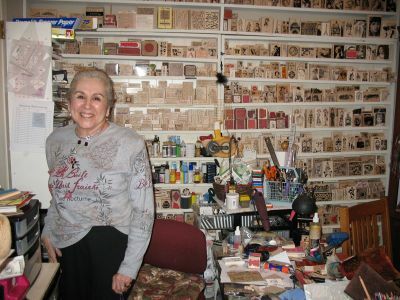 I recently visited my friend Judy and got to see her studio space.� All I can say is “WOW!”� I had to go back out to my car and get my camera.� She has the most wonderful collection of stamps and other stuff.� I didn’t want to freak her out too much so I only took a couple of pictures of one wall of stamps. (Yes, a wall of stamps.� And there was another half wall and more unmounted stamps in cabinets and stuff. )� And, there is still much more according to Judy!� I was just dropping her home but we�ended up playing around and talking for several hours.� So much fun!� Thanks Judy! She is also an amazing artist.� I hope someday we can get her a website or blog so that she can share her work with more people. (hint hint) :)� It was truly inspiring to be in her space. My mom recently hosted an ATC swap on the Yahoo group – ArtistTradingCards.� The theme was “Secret Life of Bees” and I made a bunch of digital cards for the swap.� I figured that since I didn’t have much time to work on them and I needed to make a bunch, I’d do a few digital cards and print out several copies.� This theory didn’t really work in practice though because�I got so excited by the cards that�I ended up spending a lot more time on them than�I originally planned.� The digital stuff was a blast and I’ll definitely be doing more of this type of art.� Here are the cards i made for this swap.